The Hudson River runs alongside this rink, and the views are so gorgeous you might feel like skating right into them and over to New Jersey. Don’t try it, of course, unless it’s been a really cold winter, or you don’t mind swimming with skates on. In the other direction, you’ll see the World Trade Center, and it’s a short walk to Battery Park for a glimpse of Lady Liberty pre- or post-skate. The rink is owned by US Olympians Melissa Gregory and Denis Petukhov, who frankly deserve a medal for the premium skating experience on offer -- it’s one of Manhattan’s less-crowded rinks too, because its limited opening hours keep it off the tourist trail. You can take private or group lessons with the cryptically named Learn to Skate USA, or buy a seasonal pass if you plan to blade-up regularly. 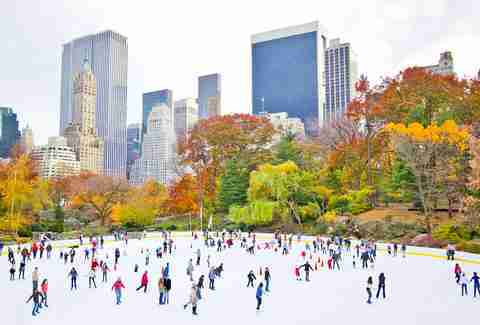 When people think of ice skating in New York, Wollman Rink is the classic image, surrounded by the Midtown skyline at the southern end of Central Park. It has a cinematic quality you won’t find anywhere else, evidenced by its frequent film appearances. It’s the place to do your best skating impression of John Cusack/Kate Beckinsale in the 2001 rom-com Serendipity, or (more likely) the calamitous Wet Bandits from Home Alone 2. 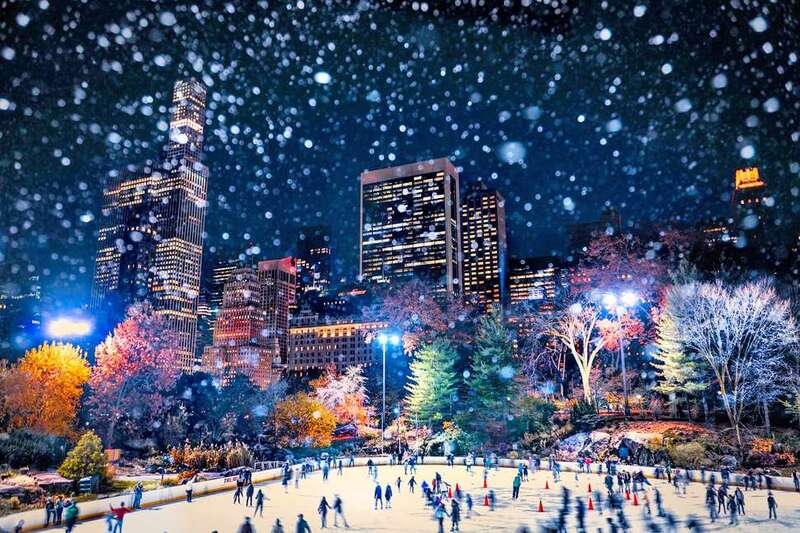 This rink is encircled by the Bryant Park Winter Village, which means you’ll have plenty of options for finger-thawing hot chocolate, and all kinds of artisanal shops and restaurants nearby. To ensure a little more space for all those triple-Lutzes, visit at quieter times (before 11am or after 6pm) -- and re-energize afterward with gingerbread cookies and warm apple cider from the Breezy Hill Orchard stand. This rink on the banks of the Hudson has one standout feature: it’s indoors, so you can still enjoy it, even in the throes of a nasty Nor’easter. Its Upper Manhattan location is easily accessible from the 1 train, and it’s far enough away from Midtown that it doesn’t get as crowded as more touristy rinks. 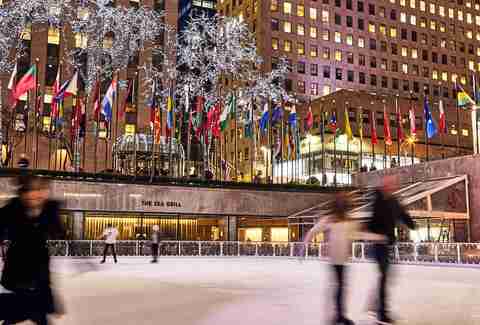 This is one of the largest rinks in New York, fit for skaters who want to practice twirls and jumps, or those who appreciate an extra-long perimeter fence to cling to. And, like Riverbank, the wide-open space is usually blissfully free of the crowds of tourists who skate in Manhattan -- situated just two blocks from the 7 train station. 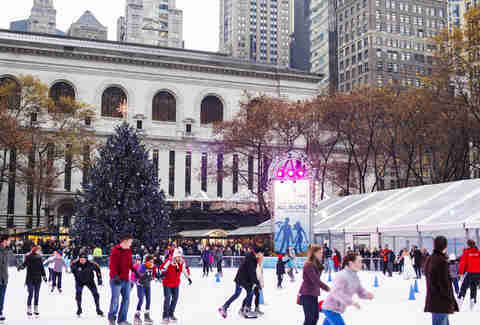 It’s the most famous skating rink in New York -- perhaps even the world. Its greatest endorsement though, is surely the fact that Buddy brought his date here in Elf. He’s not the only one who’s had that idea -- the rink is typically swarming with couples, gazing lovingly into each other’s eyes and trying desperately to stay upright. The lines are long, but there are never more than 150 people on the ice, so there’s enough space for a pirouette. If you can’t bear the wait, reserve online in advance (from $60). The Skating Pavilion is a rink for skating enthusiasts -- and anyone who fancies themselves as the next Chazz Michael Michaels. The gigantic, regularly zamboni'd surface is ideal for the hockey games and pro figure-skating coaching hosted here, but it transforms into a public rink on weekends. All-comers are welcome to develop their skills in the inspiring Olympic-scale setting. 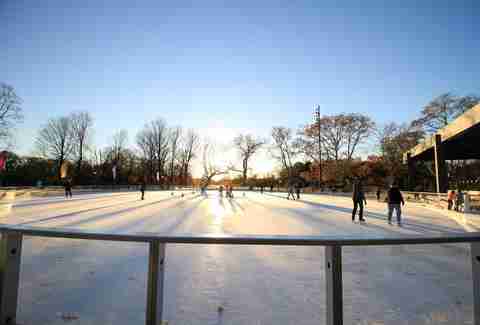 The southeast end of Prospect Park is home to not one but two ice rinks at the LeFrak Center. Tourists don’t often venture this far out of Manhattan, which helps the lines stay short and the ice stay empty(ish). The Bluestone Cafe is a relaxing spot to rest up and sip a hot chocolate, and there’s a snack bar for munchies, too. Think Coney Island is all about cotton candy, roller coasters, and boardwalk strolls in the summer sun? Think again. The Abe Stark rink is the hidden gem of New York’s skating scene, with a vast indoor surface for all ages and abilities -- from pro skaters escaping the city crowds, to first-timers who’d rather slip and tumble with fewer bystanders failing to suppress chuckles in the background. The snag is that local hockey teams book up much of the schedule, so check availability before you go. Elly Belle is a Thrillist contributor.